My new motto this year is "Do HARD Things". Life is way too short to skate through only doing what comes "naturally" or "easily". Sure, there's a time and place to relax and take it easy, but for the most part I believe success only comes when we push ourselves beyond our comfort zone. It made me examine my own life and I'm wondering if I'm just doing easy things, or am I spending time doing things that truly STRETCH me... homeschooling in and of itself is a hard activity, but even after awhile that, too, can become easier. Then, I was having a conversation with some middle school boys earlier this week. Maybe I'm in denial about what this age is all about, but it seemed like the theme of the conversation was just how lazy could one be, how little effort could be put into homework and how great the girls were. I've taught in middle school and I went to middle school. I know what the prevailing attitude is. I was a bit depressed after this encounter. It made me realize that there is an attitude among young people that doing the least amount to get by is "cool"... and that being smart and hard working definitely "isn't cool." I refuse to believe that we will mostly likely lose our children in the middle grades years to this kind of thinking! This is a large part of the reason we homeschool. We do not want our thinking to be of this world. So, between the article, the conversation with the boys, and then some pretty intense whining over math word problems, I was DONE. I had a bit of a breakdown with my kids. Me: "No, I don't think you really mean that." Child: "Yes, I just hate it, hate it , HATE IT!" Me: "I think what you really hate is forcing your brain to think really HARD. Word problems sometimes force you to do that." Child: "No, I just hate math." Me: "I still think you just hate thinking." Child: "Leave me alone. I'm doing my math." A Ha. I think I struck a nerve. Then I wondered: Am I really expecting my children to do HARD things, or do I sometimes let them take the easy way out to pad their self esteem? Do I seriously CHALLENGE them on a daily basis, or am I content with mediocrity? Our course of study for this year is much more challenging that it was the past few years... incorporating more and more elements of a classical education is working very well. I love the mental stamina necessary for our day to day learning. I love how God places events directly in our paths to get our attention. This week have been studying Martin Luther (talk about someone who did HARD THINGS). What a perfect man to learn about while contemplating doing hard things. I'm so glad our current read aloud is Martin Luther: The Great Reformer. It is easy to imagine Luther had two burning ambitions - one to become wise and the other to become good - because the later became both, and he could hardly have become so without such ambitions. If a young man would find the greatest blessing in the world, let him go in search of righteousness; if he would find the next greatest blessing in the world, let his search be for knowledge. We also have been studying the Tudors. 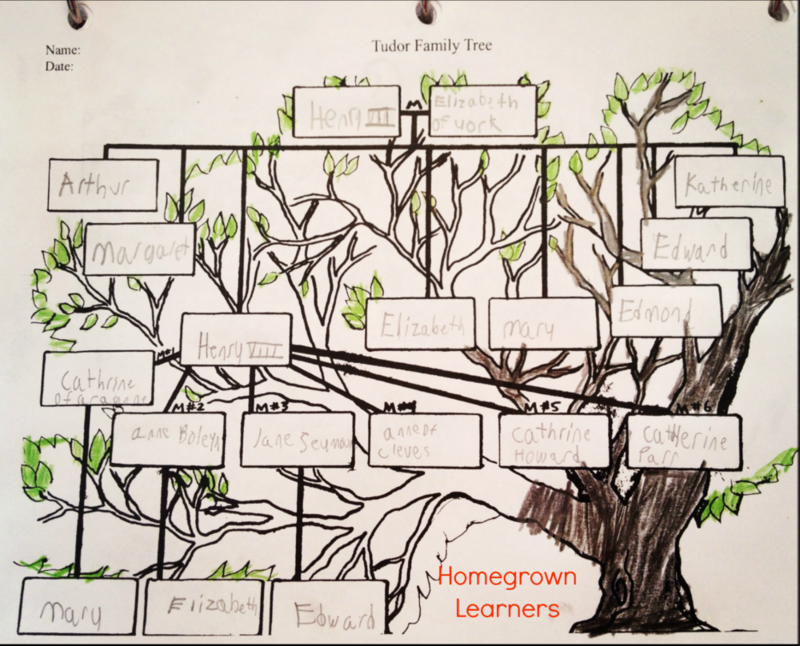 One of the activities we had was filling in the Tudor Family Tree. I was so proud of my youngest --- he filled in this tree all by himself after I read a chapter in the Story of The World. He did a HARD THING and I told him I was so proud of him. We're focusing on doing HARD THINGS in our homeschool this year. It's not because I want my kids to be super smart or because I'm prepping them for an Ivy League school. It is because I want them to know the feeling of achieving difficult things, and the feeling of using their God given talents and abilities. So, I'm putting the question to you: What types of HARD THINGS do you expect your children to do? I know that I'm expecting a lot more from mine this year! I'm linking with Hope is The Word today for Read Aloud Thursday.